I love this so so so much, I'll for sure be replicating that pretty floral! 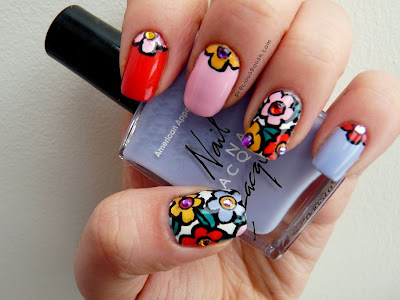 Such a beautiful mani, the colors work so well together. I love it, so joyful! Thanks, Alexis! I'd love to see your version, I bet it would be so pretty! PRETTYYYYY! i love how these turned out, and its even more amazing that you managed to come up with these RIGHT before class!! Aww, tbank you so much! So 70's ! Love !